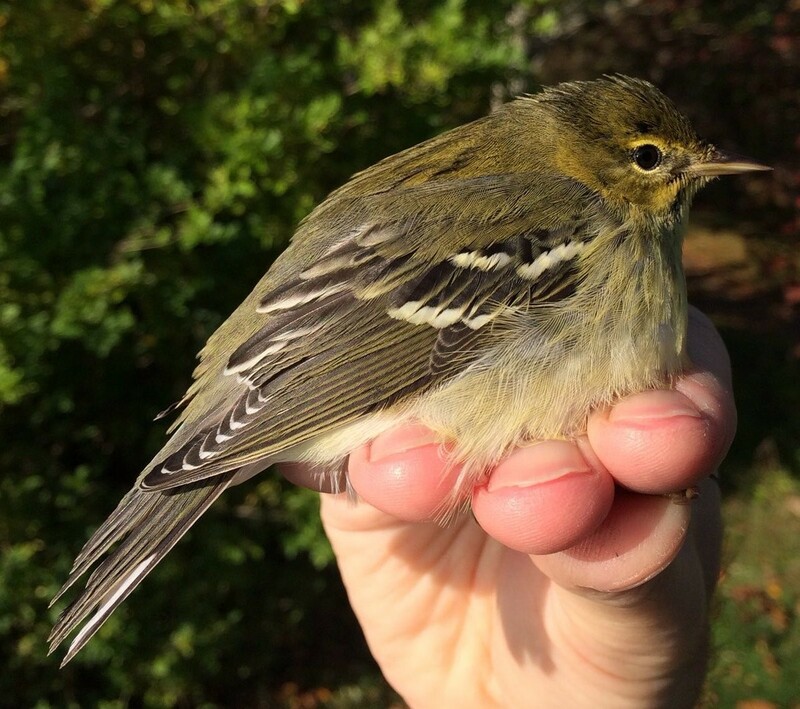 What does our 50 years of data about the Blackpoll Warbler tell us? At a time redolent with concern about the decline of many bird species, particularly Neotropical migrants, we have a bright spot to report on this year: a recent increase in the number of fall Blackpoll Warblers captured at our banding station. This news is encouraging because numbers of Blackpoll Warblers have been in rapid decline over the past several decades. BLPW with band # 2160-46794 weighed 11.5g on 20th Sep. 1999 @ 10:50, and was last recaptured weighing 17.3g on 6th Oct. @ 11:40 with a banding comment “feels pudgy”. Statistically speaking, we have good samples of Blackpoll Warblers (BLPW to the banders); since 1966, the Banding Lab has processed 1,215 individuals in spring and 8,851 in fall. In fact, Blackpoll comes in just behind Yellow-rumped Warbler as our second most common warbler species (seventh most common species overall) banded at Manomet. We should pause here to remind ourselves that BLPW breed exclusively in the great northern boreal forest, mainly in spruce, fir, and tamarack. This breeding range stretches from far western Alaska through the central forests of the western Canadian provinces to Hudson’s Bay and the northeast Maritime provinces of Canada south into the Adirondacks of New York and northernmost mountains of New England. During fall migration, all of these birds fly to the US east coast and fatten up on the abundant autumn berry crops from New England south into the mid-Atlantic. Then they largely vanish from the ken of North American birders until they arrive in the mid-spring. It had long been theorized that BLPW, unlike other Neotropical migrants that make their way south along the Atlantic coast, take a more extreme route far out over the Atlantic Ocean. 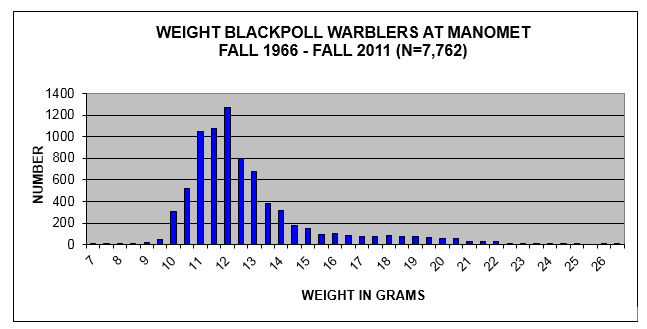 Manomet banding data show some BLPW arriving on-site at 10 grams (g) and, if the berries are as abundant as they were this fall, individuals may stay as long as two weeks+, gaining up to 2g per day of fat before disappearing. Our graph of weight distributions shows that some birds quite literally double their weight during their stay here and may weigh over 20g before departing. Observers on fishing vessels well off the Massachusetts coast have long observed BLPW landing on their decks during inclement fall weather. There are also fall records of BLPW as far offshore as Bermuda. A recent study by scientists out of the University of Massachusetts placed small geolocating devices (learn how we’ve used geolocators for our Semipalmated Sandpiper research) on BLPW in the fall, finally proving these suspicions of transoceanic migration. The GPS tracks from these birds showed irrefutably that fat-laden BLPW embark on non-stop flights from the northeast coast over the Atlantic Ocean, flying 1,500 or more miles non-stop for up to three days! BLPW spend the next several months wintering from Venezuela to the upper Amazon basin in tropical rain forests before they journey north to their breeding grounds. By analyzing deuterium ratios—a stable isotope of hydrogen, found in extremely small amounts in nature—in feathers collected across the Blackpoll Warbler’s range, including from our property here at Manomet, Dr. Rebecca Holberton and her colleagues demonstrated that fall BLPW at Manomet originate in breeding populations from Alaska to the northern Canadian Prairie Provinces. Spring migrants, however, were a quite different group, breeding in New England mountains and the boreal forest of the Canadian Maritimes. So how far does a spring BLPW travel from the winter range in Amazonia to the breeding range in say, Newfoundland? About 7,000 km (4,300 miles), although this flight crosses less water in spring as they move north through the Caribbean Islands and by stages up the east coast. But a BLPW breeding in W. Alaska with a fall migration route to Manomet and thence non-stop over the Atlantic to Venezuela will cover about 11,000 km (6,800 miles)—every year. With such an epic migration route, it stands to reason that BLPW are vulnerable to many of the factors that contribute to avian declines. Manomet studies with Boston University colleagues Richard Primack, Amanda Gallinat, Libby Ellwood, and Abe Miller-Rushing (2008, 2015, 2019 in prep.) show that BLPW are not advancing their spring migration timing during warmer years, presumably not being able to detect rapid spring warming trends in eastern N. America from their stable tropical winter range. They do tend to migrate later in fall during warmer years, perhaps allowing more time to breed successfully; but perhaps also missing out on peak fruiting in fall. Increased human housing and infrastructure building along the east coast are reducing areas of shrubs and forest in traditional fattening areas. Meanwhile, stronger and more unpredictable storms during the fall may make successful migration over the ocean more problematic. Matt Kamm at the Reed Lab at Tufts University recently produced the graph below showing the trends at Manomet. 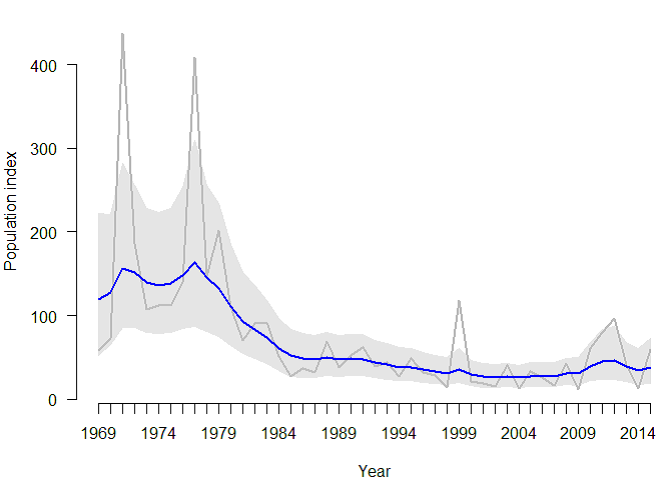 Not surprisingly, our data show a long-term decline in both spring and fall BLPW numbers (we band many more in fall because we are on a direct route of migration then, and let’s face it, they all had babies in the summer!). We feel that the blue line best represents the population trend in fall despite yearly variance in numbers. But the bright spot is that we banded over 300 new BLPW in both the falls of 2016 and 2018; numbers we haven’t seen since we banded over 400 in 1979. Reasons for this recent up-tick in BLPW numbers are up for debate, but could reflect increased breeding success or a shift in migratory routes along the coast. Future collaborations, research, and monitoring are the best way for us to determine whether these numbers are an anomaly or the start of something good. Admittedly, the 1,145 BLPW banded in the fall of 1971 may be hard to replicate, but fortunately this extreme migrant is still one of the commonest warblers to be seen (and monitored) at Manomet. We expect to have an updated trends study of all our common migrants to celebrate Manomet’s 50-year anniversary in 2019—stay tuned! Gallinat, A.S., T.L. Lloyd-Evans and R.B. Primack (in prep.) As invasive fleshy fruit availability increases in late autumn, landbirds continue to consume native fruits in coastal Massachusetts. Ellwood, E.R., A.S. Gallinat, R.B. Primack and T.L. Lloyd-Evans. 2015. Autumn migration of North American landbirds pp. 193-205. 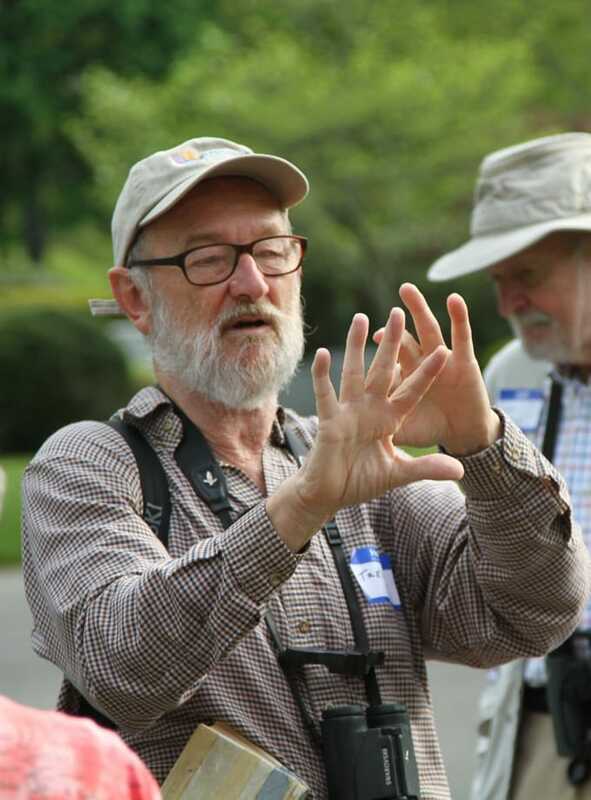 In Phenological synchrony and bird migration: changing climate and seasonal resources in North America (E.M. Wood and J.L. Kellerman, eds.). Studies in Avian Biology. Cooper Orn. Soc. CRC Press, Florence, KY.
Holberton, R.L., S.L. Van Wilgenburg, A.J. Leppold and K.A. Hobson. 2015. Isotopic evidence of “loop migration” and use of the Gulf of Maine Flyway by both western and eastern breeding populations of Blackpoll Warblers. Journal of Field Ornithology 86(3):213-228. Miller-Rushing, A.J., T.L. Lloyd-Evans, R.B. Primack and P. Satzinger. 2008. Bird migration times, climate change and changing population sizes. Global Change Biology 14(9):1959-1972.